Boutique of Quality Books, 9781945448133, 98pp. Fourteen-year-old Clara Hargraves lives on a farm in Hopkinton, a small New Hampshire town, during the early 19th century. She has a couple of big problems. First of all, she has a stepmother, Priscilla, who used to be her spinster schoolteacher aunt. Clara resents that her late mother’s older sister has not only married her father but is about to have a baby. To make matters worse, “Prissy Priscilla” keeps trying to make the rambunctious, clever, and witty Clara act like a proper young lady. Secondly, Clara has red hair, making her a target for teasing by a handsome older boy, Dickson Weeks, and by her pretty seventeen-year-old Dread Cousin Hetty. Clara, however, has a secret plan she hopes will change this. During the last week of June, 1825, Clara’s town is abuzz because the famous General Lafayette is about to visit their state during his farewell tour of America. In those eventful seven days, Clara learns a lot about her family, Hetty, Dickon, herself, and about Lafayette. She comes to understand the huge and vital role the young French aristocrat played in America’s Revolutionary War and to see that her problems might not be quite so terrible after all. Dorothea Jensen is the author The Riddle of Penncroft Farm and A Buss From Lafayette, which is set in the small New Hampshire town where Dorothea lives. Sienna Larson co-authored two books on international education and has created curricula for French and English language instruction for adults and children. 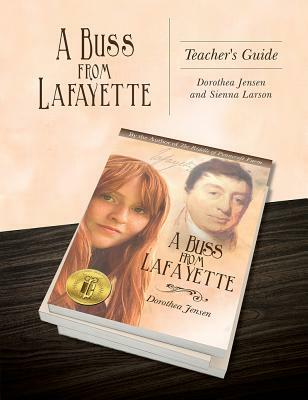 "This teacher's guide gives many wonderful suggestions of how to integrate subjects with the historical content of A Buss From Lafayette, and suggests questions that challenge higher level thinking." —Susan Elliott, Ph.D., Associate Professor, Quinnipiac University Literacy and Curriculum Development.